Temporomandibular joint and muscle disorders, commonly called TMJ, are a group of conditions that cause pain and dysfunction in the jaw joint and the muscles that control jaw movement. We don't know for certain how many people have TMJ disorders, but some estimates suggest that over 10 million North Americans are affected. The condition appears to be more common in women than men. TMJ is referred to by different names such as TMD, TMJ disorder, and TMJ dysfunction. The temporomandibular joint connects the lower jaw, called the mandible, to the bone at the side of the head, which is the temporal bone. If you place your fingers just in front of your ears and open your mouth, you can feel the joints. Because these joints are flexible, the jaw can move smoothly up and down and side to side, enabling us to talk, chew, and yawn. Muscles and ligaments attached to and surrounding the jaw joint control its position and movement. The temporomandibular joint is different from the body's other joints since the joint actually dislocates after opening past a certain point. The combination of hinge and sliding motions makes this joint among the most complicated in the body. Also, the tissues that make up the temporomandibular joint differ from other load-bearing joints, like the knee or hip. 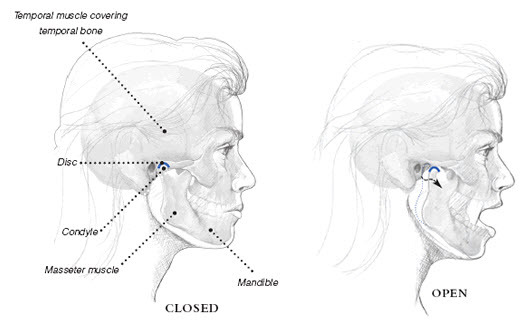 Because of its complex movement and unique makeup, the jaw joint and its controlling muscles can pose a tremendous challenge to both patients and health care providers when problems arise. Myofascial pain, the most common temporomandibular disorder, involves discomfort or pain in the muscles that control jaw function. Internal derangement of the joint involves a displaced disc, dislocated jaw, or injury to the condyle. Arthritis refers to a group of degenerative/inflammatory joint disorders that can affect the temporomandibular joint. People who have a rheumatic disease, such as rheumatoid arthritis, may develop TMJ disease as a secondary condition. Rheumatic diseases refer to a large group of disorders that cause pain, inflammation, and stiffness in the joints, muscles, and bone. Both rheumatoid arthritis and some TMJ disorders involve inflammation of the tissues that line the joints. The exact relationship between these conditions is not known. Trauma to the jaw or temporomandibular joint plays a role in some TMJ disorders. But for most jaw joint and muscle problems, scientists don't know the causes. For many people, symptoms seem to start without obvious reason. Research disputes the popular belief that a bad bite or orthodontic braces can trigger TMJ disorders. Because the condition is more common in women than in men, scientists are exploring a possible link between female hormones and TMJ disorders. There is no scientific proof that clicking sounds in the jaw joint lead to serious problems. In fact, jaw clicking is common in the general population. Jaw noises alone, without pain or limited jaw movement, do not indicate a TMJ disorder and do not warrant treatment. The roles of stress and tooth grinding as major causes of TMJ disorders are also unclear. Many people with these disorders do not grind their teeth, and many long-time tooth grinders do not have painful joint symptoms. Scientists note that people with sore, tender chewing muscles are less likely than others to grind their teeth because it causes pain. Researchers also found that stress seen in many persons with jaw joint and muscle disorders is more likely the result of dealing with chronic jaw pain or dysfunction than the cause of the condition. There is no widely accepted, standard test available to correctly diagnose TMJ disorders. Because the exact causes and symptoms are not clear, identifying these disorders can be difficult and confusing. Currently, we note the patient's description of symptoms, take a detailed medical and dental history, and examine problem areas, including the head, neck, face, and jaw. Imaging studies may also be recommended. You may want to consult your doctor to rule out other causes of pain. Facial pain can be a symptom of many other conditions, such as sinus or ear infections, various types of headaches, and facial neuralgias (nerve-related facial pain). Ruling out these problems first helps in identifying TMJ disorders. For many people with TMJ disorders, short-term use of over-the-counter pain medicines or nonsteroidal anti-inflammatory drugs (NSAIDS), such as ibuprofen, may provide temporary relief from jaw discomfort. When necessary, we can prescribe stronger pain or anti-inflammatory medications, muscle relaxants, or anti-depressants to help ease symptoms. We may recommend an oral appliance called a bruxism splint, stabilization splint, night guard, or bite guard, which is a plastic guard that fits over the upper or lower teeth. Stabilization splints are the most widely used treatments for TMJ disorders. Studies of their effectiveness in providing pain relief, however, have been inconclusive. If a stabilization splint is recommended, it should be used only for a short time and should not cause permanent changes in the bite. If a splint causes or increases pain, stop using it and let us know. The conservative, reversible treatments described are useful for temporary relief of pain - they are not cures for TMJ disorders. If symptoms continue over time, come back often, or worsen, please let us know. Other types of treatments, such as surgical procedures, invade the tissues. Surgical treatments are controversial, often irreversible, and should be approached with caution where possible. There have been no long-term clinical trials to study the safety and effectiveness of surgical treatments for TMJ disorders. Nor are there standards to identify people who would most likely benefit from surgery. Failure to respond to conservative treatments, for example, does not automatically mean that surgery is necessary.